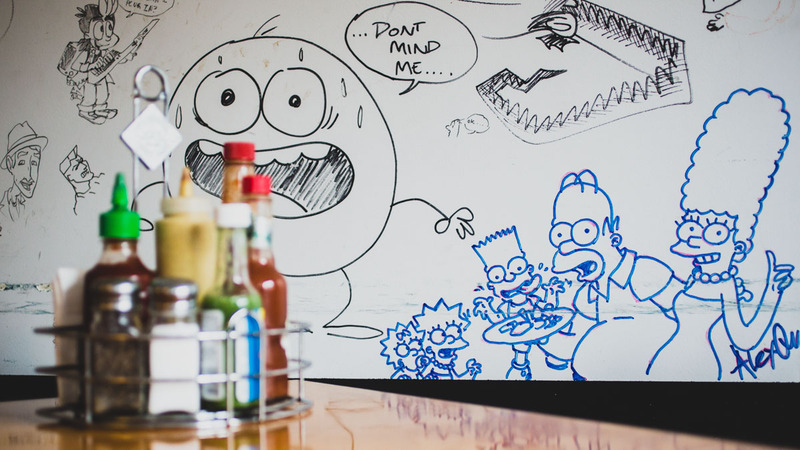 Nestled amongst some of the film and entertainment industry's most celebrated animation studios, lies a deli that exalts the illustrators who bring to life many of the beloved cartoon characters seen on televisions all across the planet. Moore's Delicatessen in Burbank, CA, offers a canvas for these artists to express themselves through their natural talents — by letting them draw directly on its walls. 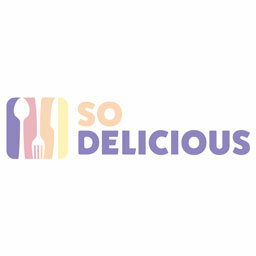 The deli is run by Robert Moore, a former executive chef for Dodgers Stadium and the Staples Center. During his time as an executive chef, Moore found that working with huge customer volume and millions of dollars in sales burnt him out. He wanted to start his own smaller, more intimate, enterprise. "I always wanted my own deli, and I came across a picture of Moore's Delicatessen that my grandparents owned back in 1946 in San Francisco," he said. "Then this opportunity came along and now my dream had come true." 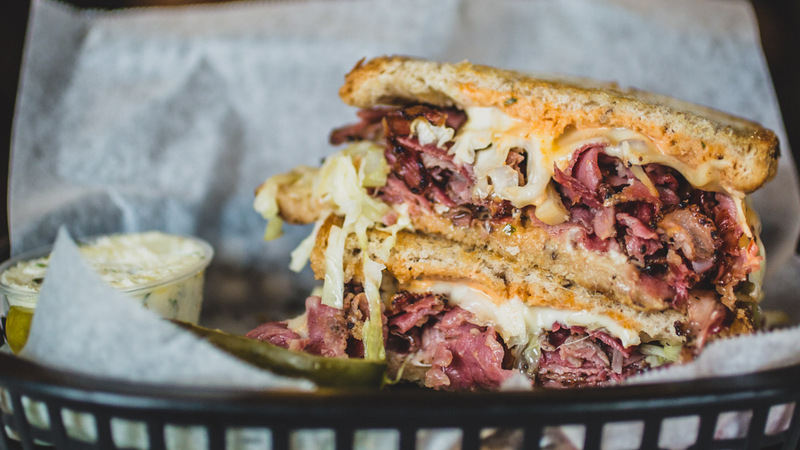 That opportunity was a space in Burbank, and after scraping the money together, Moore opened his own Moore's Delicatessen, inspired by his grandparents' former business. 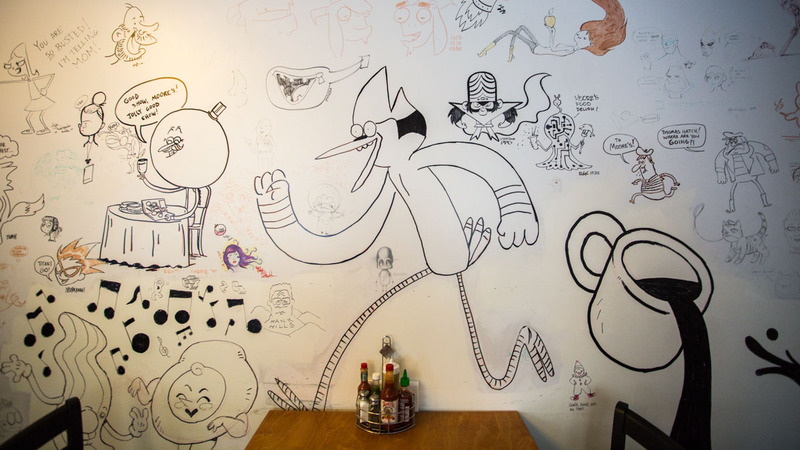 Walking into the dining area of Moore's Deli, guests are immediately transported inside a magical sketchbook: The walls of the deli are garnished with drawings from animators who hail from neighboring studios, illustrating characters they've put on television or simply a creative doodle they want to share with the deli. "Originally the walls were just white," Moore explained. "We used to be open in the evenings, and the animators from Adventure Time would show up and they'd watch their new episodes air back in 2011." Moore recalled he would see the professionals doodle on napkins and had the idea to give them some Sharpies and let them draw on the walls. With those literal strokes of genius, Moore's infamous cartoonist wall began gradually evolving into a living sketchbook over the course of the decade. Even the late Stephen Hillenburg, creator of the prolific animated series SpongeBob Squarepants, would frequent Moore's Deli about once a week. "He loved the tempeh sandwich," Moore recalled. "He always ate very healthy." One of the wall's earliest sketches was from Hillenburg himself, an illustration of Patrick Star. 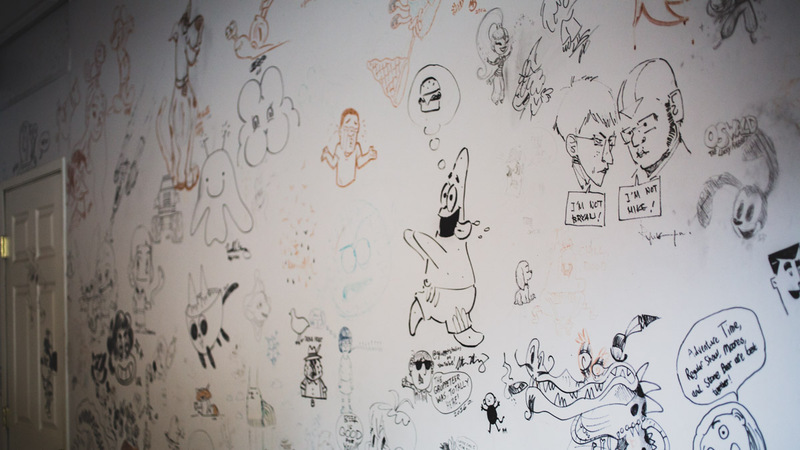 Moore's always open to artists and animators adding more to his wall, though he has just one condition before you put pen to plaster. "You have to get a paycheck, probably," he laughed, explaining that he would prefer the wall space be reserved for professional animators. Moore says that parents would come in and let their kids draw all over the walls in the earlier days, and he would have to paint over it in order to keep the professional aesthetic. Today, artists are still frequenting the deli from nearby studios and Moore says that one of his favorite things about coming into work is finding additions to his wall. He welcomes all to visit and take in the creativity that flows through that dining room. The pastrami reuben is pretty good, too.